In April, 1959, Life Magazine started what they called “a great new series” entitled “How The West Was Won”. The series included photos and stories of the American expansion into the West. A story of the struggle between the settlers, wagon trains, railway lines, cowboys, ranchers, and Native Americans who were all fighting for different ways of life in the same space. The photo series was the creative impetus for a screenplay by the same name credited to James Webb, and turned into an incredible classic Western film. Divided into 5 segments spanning, more or less, two generations, the movie runs 162 minutes and boasts an incredible Hollywood roster of all-stars including Jimmy Stewart, Carroll Baker, Gregory Peck, John Wayne, Debbie Reynolds, Karl Malden, Agnes Moorehead, John Wayne, George Peppard, Richard Widmark and Henry Fonda. The movie rightfully won all of the awards and was re-released recently with all kinds of digital scrubbing to clean up film quality. An all-star cast, a compelling drama, a magnificent score, and an incredible visual presentation made this Western beloved by millions, including me. I grew up watching this film again and again and again. To my childish mind, this was not a “Western” (whatever that was, I could not say) but a great American story. A living history film of sorts. When, as a thirty-something mom, I discovered the author, Louis L’amour, I was shocked to find out that there was a book by the same name. Naturally, I presumed that the book preceded the movie, but I was wrong. 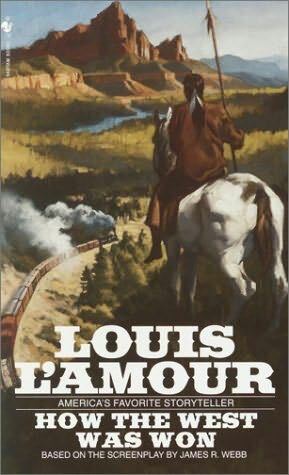 Apparently, Louis L’Amour was one of many Americans who thought that it was one of the most interesting Western stories told, so he decided to capture it in a story that’s approximately double the length of many of his more popular books. Thanks to his Lonesome Gods, I was already convinced that Louis L’Amour was one of the greatest cowboy writers. I was not at all surprised by his treatment of one of my favorite childhood films. The last three sections in particular, L’Amour takes the genius of the film and treats it as a skeleton upon which he can build flesh. He gives us new backstory for many of the characters, he explains the culture of the wagon trains in a way that the movie conveys only visually, and his love for the West is poured out in his descriptions. Where the movie presumed our knowledge of Westerns, L’Amour tells the story of the West so that we better understand the context of the action. For lovers of the film, it is a deeply fulfilling reading experience. On my first reading of the book, I was a little saddened by what I perceived to be a lack of passion for the early sections of the story. On my second reading, I thought that the writing was stronger than I did the first time, but still lacking. It seems to me that two things are at work. 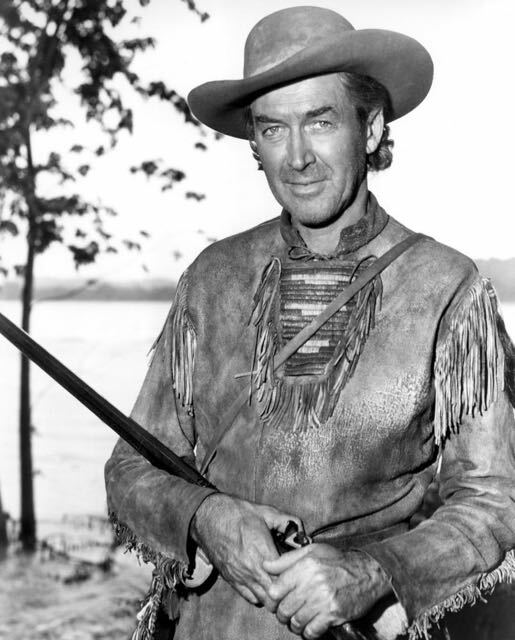 Firstly, Jimmy Stewart’s genius is in his nonverbal’s and his accent. 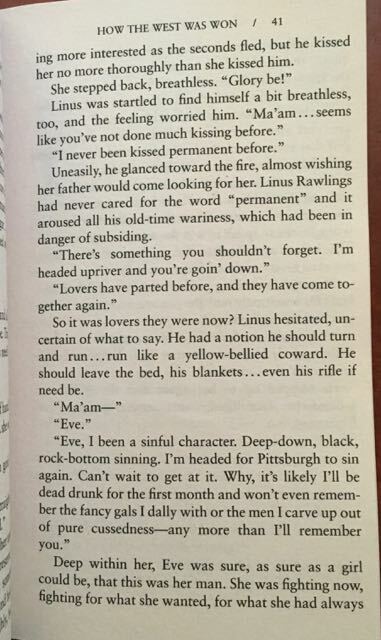 I think it was very hard for Louis L’Amour to capture Linus Rawlings in the text as well as Stewart conveys him in the film. Secondly, I think that Louis L’Amour has less sympathy for the journey west than he does for the actual life in the west – and it shows in the way he writes about both. Both the film and the book have essentially five main sections. Each section is governed by one specific idea and specific characters feature most prominently in that particular section. In this way, we have many vignettes strung together through one family bloodline. Perhaps a little bit like L’Amour’s Sackett series, this is a series of stories of people who are connected in two meaningful ways: their family membership, and their need to move west. In each case, the section and the characters have their own stories to tell and have their own needs to resolve, but they work in such a way that we get a composite picture of two generations who claimed the west for America. At one point, Zeb Rawlings sincerely gives his word to an Indian leader that the Iron Horse will not stop on their hunting land. 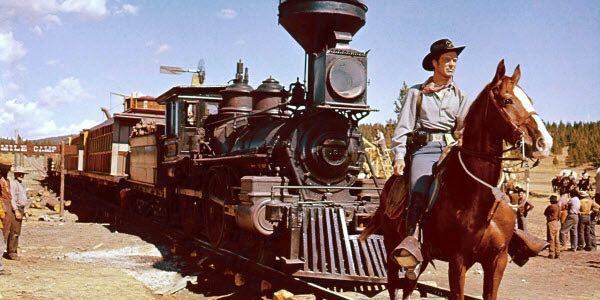 The railroad, he promises, will go through the hunting land but it will not bring settlers to this space. This was a catastrophic misunderstanding on Zeb’s part and it is, more or less, the theme that propels the entire story forward. The West would be settled, no matter the cost, no matter the harsh environment, no matter the wars. It was not a question of whether or not the West would be won for America, it was simply a matter of who would get there first and who would make the most money doing it. This incredible look into American history is obviously fiction, but like any good living history book, it beautifully captures the essence of what was happening and answers the question as to why. More importantly, this is one of those themes that is uniquely American. It is the story of a people, and some of their story persists in Americans today. Additionally, like Ralph Moody‘s desire to capture the stories of the West before they were gone, Louis L’Amour is reminding us that progress and expansion will always be a part of our story and that if we fail to remember the stories, we will lose the history that reminds us of where our future is. I am always asked in which order to read books, and which order to read or view a book-to-movie project. Nearly always my answer is the same: publication order. This is not an exception. I think that L’Amour does a beautiful job of honoring the film, but I believe he thought that we would all know the movie before we picked up his book. While I think you can appreciate them in any order, I highly recommend starting with the movie, and then feasting on the novel. One word of warning: there are one or two scenes in the story that are not for younger readers. I am including a photograph of the most concerning of them here. Parents may want to use some discretion as to how to handle this section if using the book for family read aloud or sharing with a cowboy loving young reader. I saw that movie in CinemaScope (similar to today’s iMAX) when I was a young, impressionable teen about 50-some years ago. I wrote a rave review about it in my diary. It was an incredible experience. I mean Cinerama. May be the same thing, I don’t know.